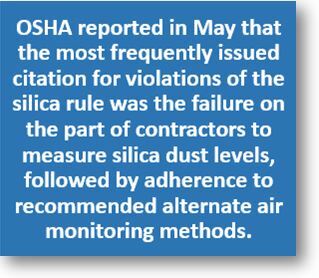 In an effort to help construction contractors comply with its new Respirable Crystalline Silica Standard for Construction, the Occupational Health and Safety Administration (OSHA) has released instructional videos and other free educational materials about the topic. Some of the aids provided by the agency, Safety + Health reported, are a customizable slideshow presentation to help employers train construction workers; a short YouTube video about how to protect employees from silica dust; a video series on dust control methods for common construction tasks; and a website with answers to frequently asked questions. The rule went into effect for the construction industry on Sept. 23, 2017, but OSHA delayed full enforcement by a month to Oct. 23, 2017, giving employers more time to comply and the agency more time to develop detailed enforcement guidelines. The deadline for laboratory evaluation of exposure samples started on June 23, 2018.